How often do you think about your impact on the environment when travelling? VoyageVert is a project set up to radically change the way people travel by offering a sustainable transatlantic sailing ferry. Imagine sailing into New York as the sun is rising, having just sped across the Atlantic in under a week. The transformative journey has been made on a cutting edge ship, powered by wind and renewables. Safe, comfortable and efficient, the nurturing environment onboard has encouraged a fresh perspective on life. The friendly and experienced crew have created an onboard feeling of community and ease. 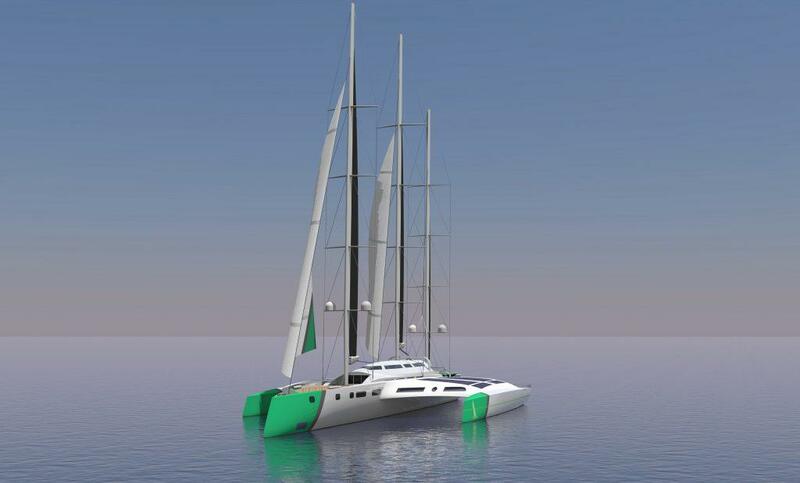 VoyageVert prepare to launch environmentally conscious voyages as a sustainable alternative to flight. Supporting the slow travel revolution, once the pilot project on our donated 35metre catamaran has run successfully for two seasons, the company plan to run voyages beginning as soon as 2020 on safe, comfortable, high technology multihull ships carrying 100+ passengers at a time. So why the need for alternative travel, after all, we have planes don’t we? With increasing oil prices and firmer sanctions placed on aviation CO2 limits in the future, the industry will continue to look less and less appealing to the environmentally aware passenger. Long haul flights account for a catastrophic 750 million tonnes of carbon dioxide emitted into our atmosphere each year, and there is currently no viable alternative to this. VoyageVert are offering an environmentally sound solution. The travel experience they hope to offer will be a world apart from the high-density, cramped and rushed style of modern air travel. While the transatlantic crossing will be fast in terms of ocean travel (a few days), it’s not an overnight flight. While on passage you’ll be able to relax, learn from on-board experts in scientific, oceanic wildlife and other fields, engage with fellow passengers, and discover more about yourself. With as much involvement in the onboard community as you like, allow the experienced facilitators to make this time an enriching experience. VoyageVert Co-Director Ross Porter explains the importance of the experience we are offering; “We know that the aims and goals of this project will affect the sensibilities of a society that have become used to travelling, at a considerable cost to the environmental, in a few hours to the other side of the world. We are offering a service that literally flies in the face of “time is money”. We want to say to this zeitgeist “slow down and enjoy the simple joys in the world”. The organisation is passionate about changing the thinking around overseas transport, in a time when most people’s automatic choice would be flight. VoyageVert is currently Crowdfunding for next phase of development. After eighteen months of sheer hard work and personal finance the Crowdfunding campaign will help take VoyageVert towards into the next stage of development. This will include continued research, and the promoting and sale of shares in their vessel to launch the first modern transatlantic ferry boats.